Remember that random dongle that showed up at the FCC a few weeks back, looking like a knockoff Chromecast, 3rd party Android TV unit? It’s real! Sort of. 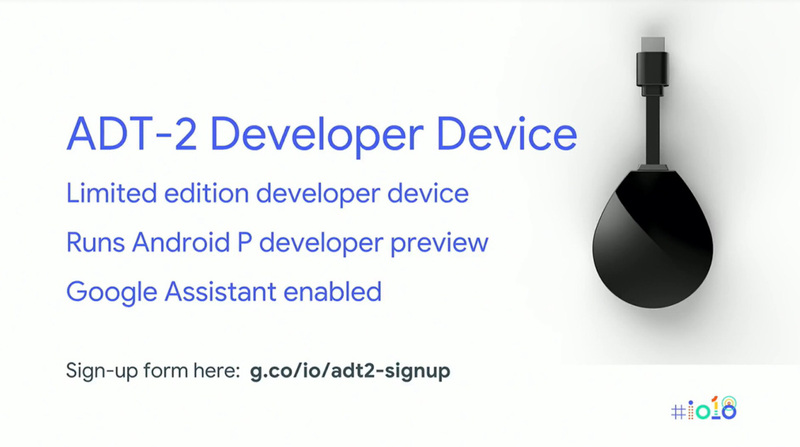 Google actually announced it today at I/O as the ADT-2, a developer unit that won’t ever be sold in stores. Seriously, that dongle I mocked pretty heavily is real as a developer-only device. So that means it’s a proper follow-up to the ADT-1, which was essentially the first Android TV box for developers to test apps for. That device didn’t hit retail at any time either. Google didn’t talk a lot about it today, only that they think it’s a pretty cool unit. It’ll run Android P, comes with a Google Assistant remote, and will receive regular updates from Google. If you are a developer, you can sign-up for one right now at this link. Video: Android P Beta First Look and Tour!